Justice League: Movie Clip - How Many of You Are There? 'Justice League' cast gets Fandango'd and field some fan questions. 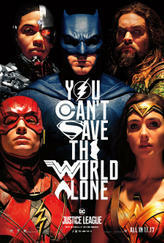 Featuring Ben Affleck, Gal Gadot, Henry Cavill, Jason Momoa, Ezra Miller, and Ray Fisher. Looking for movie tickets? Enter your location to see which movie theaters are playing Justice League (2017) near you.